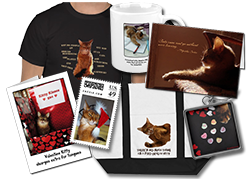 You are here: Home / Shop / Special Items for Special Kittys / Trapped in the Trapacat – and Giveaway! 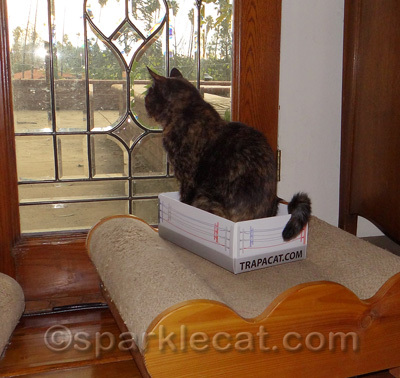 Trapped in the Trapacat – and Giveaway! 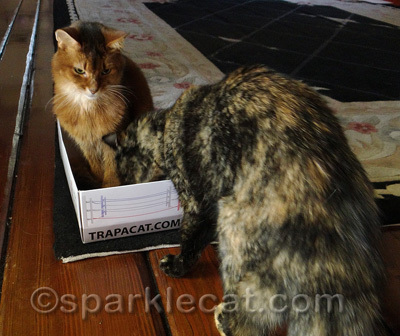 I was really hoping to review this Trapacat without any tortie intervention but I guess that was asking for too much. Just what is a Trapacat, you ask? 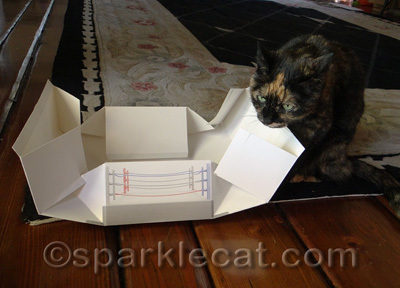 It’s the most logical cat toy you could possibly think of: it folds into a box! It comes flat and is fairly easy to assemble. It took a little bit of brain power from my human to get it right… and of course she only realized afterwards that there is a diagram right on the website! Ta-da! Done! And I got to hang out in it first. 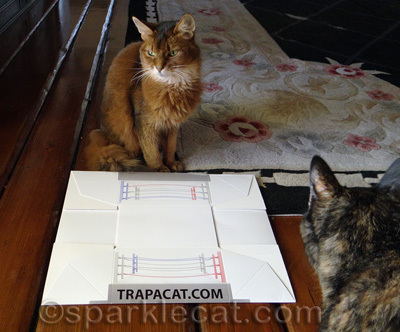 The Trapacats come in three different designs, the Beach Theme, the Jungle Theme, and the Boxing Ring theme. 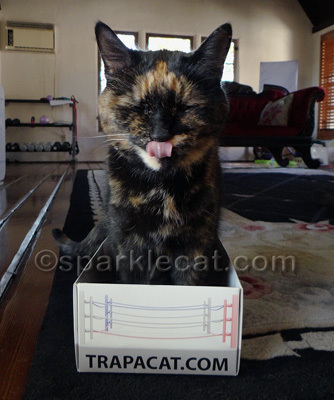 My human picked out the Boxing Ring because she thought there was a 50-50 chance there would be smacky paws over it. But somekitty was way out of bounds! I only count this as a temporary setback. 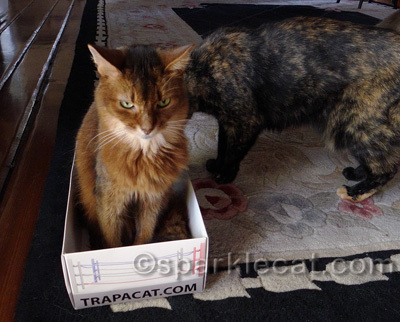 The Trapacat may seem like sort of a silly concept, but it really did work! During the time we’ve had the box it got moved around a few times, and somekitty would go hang out in it, no matter where it was. And my human liked that it looked nicer than the shipping boxes we usually want her to keep for us. It is a little bit of a tight fit for a large cat — Boodie sniffed around it, but so far hasn’t gotten in it (she prefers her boxes large). A big cat who likes a snug fit will like it, though. But the best news is that the Trapacat human said I could give one away to one of my readers! All you need to do is look at the Trapacat website and tell me in the comments below which theme you would like. Do this by midnight Pacific Time on Sunday, December 8 and I will randomly pick a winner! The company is located in Canada, so the giveaway is open to readers in Canada and the continental United States. Good luck! Disclosure: I got the Trapcat for free from the Trapacat human and received a small compensation for my review. Opinions are strictly my own. What a strange product. I mean, it seems so obvious, and yet…! A box is the perfect cat magnet. 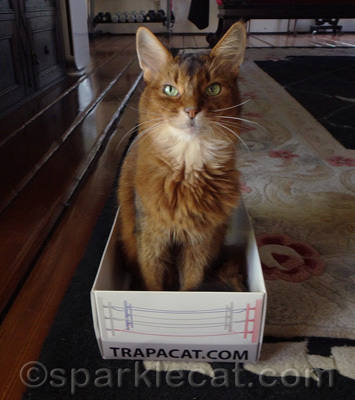 Well, most interesting this Trapacat……..we all love boxes – right? These just have some cute designs on them and look to be a nice “sit in” size. I quite like yours, Sparkle, but I also thought the Jungle Design was pretty swell. I’d love to have one (assuming my Mom could handle putting it together). What a nice giveaway…….I hope you got that box back eventually???? We have the same Trapacat!!! The boxing ring is perfect for me and you-know-who! No need to enter us in the giveaway…we’ll step aside so the others have a chance. The publicist says she likes the jungle theme. Sherpa the Farm cat loves teeny tiny boxes. In fact, his very favorite box is a shoe box that the publicist keeps on his ham-mick for him. The noise he makes if she moves it! Um, seriously, that looks like a shoebox! That’s hilarious! What a great idea! mol! that is certainly a clever idea! Sparkle, Binga is like Abbott to your Costello 😉 The beach and jungle themed boxes are nice – we think we like the jungle box best. Thanks for sharing this, Sparkle, and to you and the folks at Trapacat for the giveaway! Looks like Binga won the first round but you came back and won the match. Iâ€™d like the beach theme. I canâ€™t believe they charge $10 to make your own shoe box. TW said it I donâ€™t win, sheâ€™s get some colored paper and glue and make me one. Mommy is CRACKING UP! We love to win one for Shadow…in the Jungle theme! That looks like a very smart box Sparkle. This is too funny! My kitties would like a shot at a jungle box. Thanks! Trapacat? So simple, so amazing. – Crepes. This is completely nuts, therefore I love it! I can’t stop laughing. Ok, this is just too cute!! I think this would be awesome to win- my favorite is the beach theme! Thanks so much for your purrs for Maggie May. We hope to have a happy update tomorrow night! Such a cute idea! We’d love the Boxing Ring theme box. In fact, I have a picture called “The Boxing Match” showing 2 kitties going at it over a wooden crate by the artist Jamie Perry! 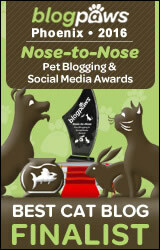 We are lobbying for OurHumans to get all three for us at the website! We think the kittens (the +2) would especially love the beach theme! What a nifty idea!! MOL! That’s funny! It does look better than the boxes we have laying around here too! We like the beach theme! It looks like somekitty took over your box and gave you the tongue! … just sayin’! WE love Binga, she’s always trying to steal your thunder Sparkle. 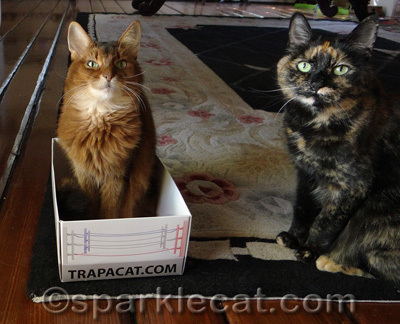 We love the trapacat, we’d love to try it too. The jungle theme looks fun for my leopard wanna be! 😎 Bubby & Kim would love the boxing ring! Beach theme is our favorite design! It is freezing here in Seattle! Thanks! I got all excited because I thought it was a real trap I could use on my sister and send her off somewhere. A box she can escape from! Boxes… my cats are crazy for! I am going to jump off of a bridge now. Pls don’t enter me because we do have boxes but I sure have to give the creators of this MAJOR PROPS……..raking in the bucks with a BOX! We like the designs but it’s way too small for us. My cats have no interest in boxes – they are weird! That does look like a great idea to have around the house all the time. Course at the moment we already have a trap a cat box being the one that all the goodies the came from Sparkle were in. It trapped Two Two, can you imagine. LOL!!!! Your photos (and that Binga) are SO pawsome! I hope you both enjoyed that box! You know Nicki would “eat” that, right? Our human thinks whoever is actually making money by *selling* cardboard that folds up into a box for cats is pretty savvy. LOL. That’s an interesting box, Sparkel. We like the beach theme too…since we never get to the beach. But we usually like boxes that have higher sides…and flaps on top…we like flaps. Those are adorable! We like the beach theme, but if we win, we would like to donate it and let the recipient decide on their favorite, if that’s OK.
We like the beach box! But they’re all cool! We think the Beach theme is great! Ellie and Allie are small so they would be a purrfect fit! That is a pretty cool box. But around here, we’d need the large size. I think my cats would prefer a bigger box just right out of the supermarket ! It’s a little small for them, but a box is a box and they have to try it out. Maybe not a matchbox. Oh, that looks like a pawsome box.